Brandon Doman, aka "The Domanator" during his BYU and NFL quarterbacking years, stepped to the sidelines to become a quarterback coach back at BYU. 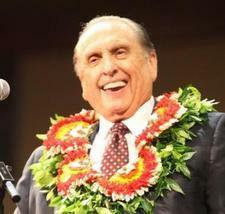 He told the audience at the Multistake Singles Conference Friday, June 25, that they can achieve what they believe. Doman said he had great role models growing up in a family of brothers who all played football well. His father consistently told him, "If the mind can conceive it and your heart can believe it, you can achieve it." He used that mantra to reach his goal — set when he was still a child — to become a starting quarterback at BYU. It took longer than he planned. He was third-string quarterback for two years and didn't get to play until after three other quarterbacks were pulled out for injuries in a game where the score was 41-0 at halftime. But then the day came when coach LaVell Edwards called him into the game. He helped turn things around that year, ending the season that started with a 4-6 record with a 6-6. "It was my turn," Doman said. "That has changed the course of my life significantly."